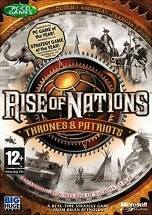 Developed by Brian Reynolds and Big Huge Games, Thrones and Patriots, the expansion pack to the critically acclaimed, best-selling real-time strategy (RTS) game Rise of Nations, adds a multitude of new features to Rise of Nations including; six new nations, a wide variety of new single player campaigns, more than 20 new units, new wonders and an innovative new Government feature. With the new Government feature, any nation, old or new, can choose exactly how to be governed, which has far-reaching effects on how units perform in various situations. All-new single player campaigns will allow gamers to control the course of history during historical events that changed the world.